Spectacular Luxury Oceanfront 3 Bedroom Mar Vista Grande Condo, 1004! 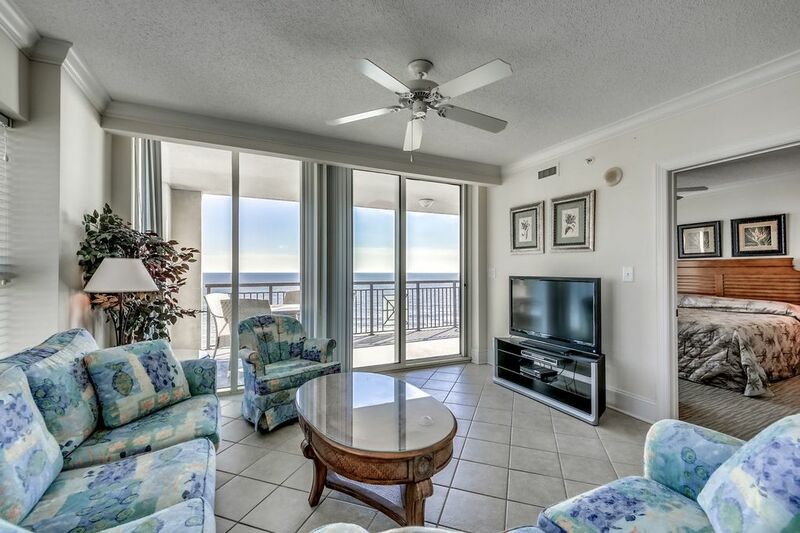 SPECTACULAR oceanfront 3 bedroom / 3 bath condo at one of North Myrtle Beach's most popular resorts, the fabulous Mar Vista Grande. This condo is beautifully furnished and appointed, with flat screen tvs, granite counter tops, a large jacuzzi tub in the master bathroom, designer furnishings and more. Enjoy your morning coffee from the gorgeous oceanfront balcony, with access from the living room and master bedroom. The master has a king bed, the second bedroom has a queen, and the third bedroom has 2 queens. This condo comfortably sleeps 10 people, with a sleeper sofa in the living room that is perfect for children. ** For your convenience and vacation enjoyment, all details are covered for you - linens and towels are INCLUDED in our rates and your beds will be made for your arrival. All rates also include departure maid service. About Mar Vista Grande: Mar Vista Grande is a perennial top resort on the Grand Strand. Perfectly situated in the Ocean Drive Section of North Myrtle Beach on historic Ocean Boulevard, the oceanfront 3 bedroom Mar Vista Grande accommodations are full of top class appointments such as granite counter tops within fully equipped kitchens, washers and dryers, and designer furnishings. The spacious and private balconies reveal panoramic views of the Atlantic Ocean, and are accessible from both the living room and master bedroom. Mar Vista Grande guests will further enhance their beach vacation with ample resort amenities provided by a large indoor pool, large outdoor pool with shallow wading area, outdoor lazy river, hot tub, kiddie pool, sun deck, and fitness center, all just footsteps from the ocean. Walking distance from the famous Main Street, Mar Vista Grande is at the center of what a vacation to the Grand Strand is all about. Activity is year round on Main Street; enjoy grooving the night away to the state dance, The Shag, or walk down to catch a free summer concert at the Horseshoe while the kids enjoy the seasonal oceanfront amusement park. Experience a beach vacation that exceeds expectations at Mar Vista Grande. Very nice ocean views and nice place to stay! Very nice place with great amenities! Everything was great about this condo except could use more tops for the pots and pans. Property is excellent and very friendly staff. Property is in excellent condition and all pictures are true to the dot. Building is close to everything and pools are amazing.